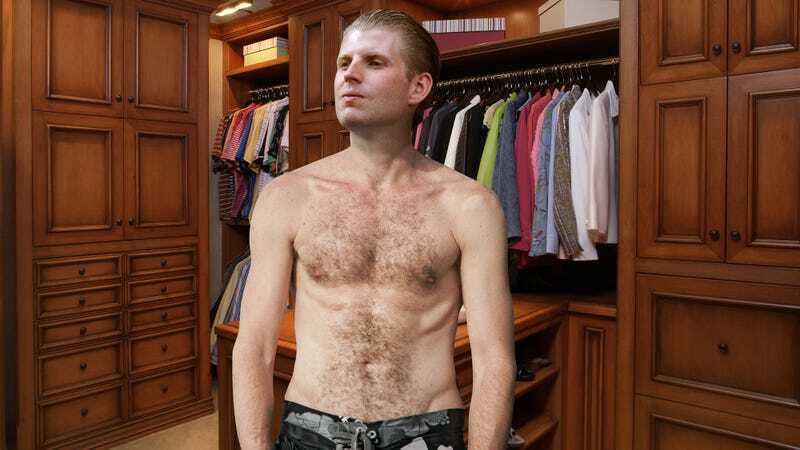 It seems like each new day of Donald Trump’s presidency, we hear yet another story of chaos taking place behind the scenes at the White House, and according to sources, today, things have been even more dysfunctional than usual: The Secret Service accidentally shot Eric Trump this morning after catching him trying on his dad’s swim trunks and mistaking him for an intruder. It’s safe to say that the Trump administration is in complete disarray! President Trump himself also downplayed the incident, tweeting that “jobs are up” since Eric was shot and that “many people are thanking me.” He then tweeted “DON’T TOUCH MY BATHING SUITS!! !” in what was initially perceived to be a rebuke against his wounded son, but the White House quickly issued a statement clarifying that it was intended as a comment on an unrelated matter. Meanwhile, sources confirm that Eric Trump is now recovering at Walter Reed National Military Medical Center, where he has been placed in a medically induced coma. Neither the president nor anyone from the first family has gone to visit him, and, according to an official spokesman, there are currently no plans to do so. While the White House is trying its best to dismiss the whole situation as a non-story, the fact that this administration sees the president’s son getting shot in the stomach as business as usual should definitely raise some eyebrows. Hopefully, Trump and his cabinet can get this chaotic situation under control as soon as possible.